Home » an academic » Facts » Health » Human Body » kids resources » Knowledge » Science » What is the Human Brain Made Of? Your brain is the commander-in-chief of your body. It tells your heart to beat, your lungs to breathe, and your eyes to blink. The human brain is the most complex human organ. Billions of nerve cells, called neurons, make up the brain. These neurons are connected, constantly interacting with each other as they send messages to all cells in the body. If you look a neuron up close, you can see that it branches off into lots of long spindly ends. One extra-long branch is called the axon. The shorter ones are dendrites. These nerve endings connect to other neurons, passing on and receiving information in the form of electrical signals. The axon sends out signals, while the dendrites receive signals from other neurons. Neurons don’t touch one another. Instead, they connect by jumping across synapses, tiny gaps between the cells. 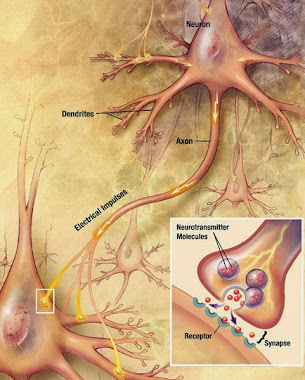 A synapse releases chemicals that travel across the gap and trigger an electrical impulse in the next neuron. The outer part of the brain, called the cerebral cortex, is grayish in color and has deep folds. This area, where most of our thinking takes place, is extremely dense with dendrites. The inner area of the brain is paler in color and known as white matter (like Thalamus). It’s mostly made up of axons. Axons are covered with a fatty substance called myelin sheath, which gives the inner brain its whitish color. Why are our brains folded? In order to save space and squeeze in as much cortex area as possible. If our brains were smooth, our heads would have to be the size of beach balls! Because it doesn’t have pain receptors, the brain can't feel pain. Thank you for reading What is the Human Brain Made Of? posted on the website Kwentology if you want to redistribute this article please include the link as the source. Have some kuwento to share? Contact us!